Jeanne Marie Uhiriwe is very happy with her solar kiosk. It is one of 25 in Rwanda and its novelty factor in Kigali’s business district regularly draws looks of intrigue. Jeanne proudly wheels out her booth to her usual downtown spot. At a glance the garish red plastic tower on bicycle wheels does look a bit odd. The compact kiosk developed by the Rwandan startup A-R-E-D is set on bicycle wheels for maximized maneuverability and has a hefty Lithium-ion battery that is powered by a pair of fold-out 40w solar panels. The kiosk is designed to be able to charge up to 30 electric devices at any one time. Clients pay 100RWF (14 cents) to plug in and charge their electric device – nearly always a phone, but occasionally tablets and audio devices – for up to two hours. This is Jeanne’s first business and a big step up from where she had foreseen herself a few months back. She feels blessed to have her independence and to be her own boss. According to A–R-E-D, Jeanne is currently very much in the minority; most women approaching them just aren’t able to pool together the necessary funds for the deposit. Indeed A-R-E-D is reaching out to women’s savings groups to try and address this issue, and in a bid to encourage women they have extended the repayment schedules for women from 12 months to 18 months. In a country where approximately 28% of the population is not served by formal financial mechanisms, access to loans can be tricky. Jeanne was lucky enough to be able to approach her village’s family association for funding. Until that moment she felt destined to follow the family line into diary farming in her rural community of Kayonza, in Rwanda’s eastern province. Jeanne also met the other vital criteria for solar kiosk franchisees – she can read and write, and successfully completed fourth grade. She feels fortunate that she completed her primary education, because globally, girls make up 54% (31 million) of the out-of-school population. Jeanne sees her solar business as a stepping-stone onto bigger things. The 23 year old is confident that she will have settled her loan within the 18 months and has her sights set on doing a management course. Did you know? A girl’s future income can be boosted 10-20% for every year she spends in school. 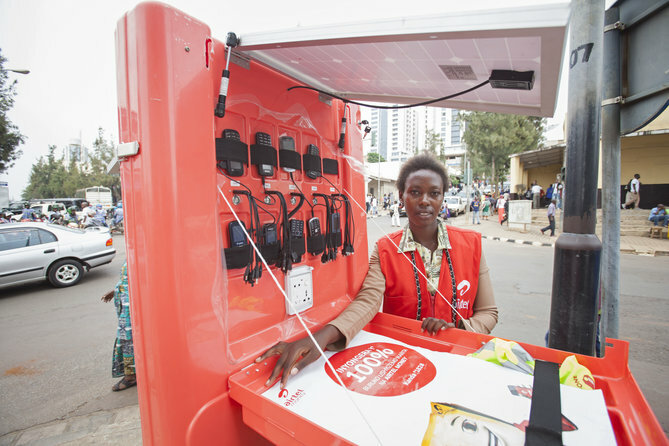 Jeanne seems to have a natural nous for business; downtown Kigali with relatively regular electricity may not seem like the most obvious positioning for a solar powered charging kiosk but amongst the bustle, business is booming for her. The majority of clients are on the move and will pay the full 100RWF to charge their device for a mere five minutes before continuing hurriedly on their way, enabling her to ramp up turnover. There are also periodic power outages when business soars and the booth turns out a near non-stop chorus of ringtones and vibrations. Located back in her quieter rural town, Jenny believes that she would be charging a full booth of phones much of the time but she says that in contrast, each charging slot would be occupied for the full two hours, thus being less profitable. Jeanne can choose her own work hours but nearly always does a 12-hour shift, only stopping on Sundays. For the time being business is good and she is happy to be running her own show and making money. With growing success she is finding herself increasingly becoming a figure of financial support within her immediate family and able to support her siblings with school costs. But what makes her most proud is returning back to her village where she feels she is now held in higher esteem as a professional with a successful business. Demand better for girls and women ever. Sign our petition NOW!